Bristol is the national base for the Defence Equipment and Support board (DE& S). Known locally as MOD Procurement at Abbey Wood. This is where the major decisions are made about MOD spending. The number of large military contractors who have a base at Bristol Business Park and elsewhere around town highlight its importance. The NAO report, which gives a progress review of the 16 largest defence projects, shows that in the last year there has been a total forecast slippage of 139 months and increase in costs of £468 million. Feb 2013: Parliamentary Public Accounts Committee reports on MOD stock inefficiency and waste. 2011: The £53.5 billion approved cost of all 2011 projects increased to £59.6 billion. Since 2000 the MOD has offset £8 billion increased costs by reducing equipment numbers ordered. The Astute submarine programme accounts for £1 billion increase over the past 3years! Another Guardian article reveals the millions the MOD spends on consultants. The Times Newspaper carried out an investigation in Jan 2011 using a previously unpublished report by Deloitte, consultants. Here are the 10 worst overspends at the MOD, with Nov 2011 National Audit Office and Parliamentary Public Accounts Committee updates added by BAAT. It highlights the the scale of MOD incompetence and inefficiency and claims MOD could save £4 billion by saving 20% of its running costs. The MOD itself reported that it overspends on procuring equipment by up to £2 billion a year. 1. Nimrod MRA4. BAE was commissioned to upgrade the aging Nimrod Mk2 surveillance aircraft in 1996 by Michael Portillo then Defence Secretary ( itself a very dodgy decision) BAE Systems later hired Portillo as a non-executive director from 2002 to 2006. Options of new aircraft from 2 other countries were discounted against spending billions on a plane that took to the skies in 1949. Expected cost for 21 planes £2.8 billion Actual cost for 9 planes £3.8 billion. Project now cancelled. None produced for service. There are some interesting aspects which are highlighted by this fiasco ( well BAE don’t crow about it!) How did BAE convince the MOD theirs was the best option? The door to No 10 is still open to BAE Systems today. Why was it allowed to go on for so long when even I could have foreseen it was a hopeless waste of money. BAE Systems still got £3.8 billion for a product which was basically not fit for use. BAAT campaigns for the contraction of spending on arms, eventually to nil! See page on zero military expenditure. Nothings impossible!! 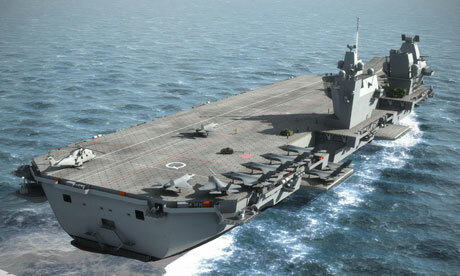 A computer-generated image of one of the planned aircraft carriers. Controversial plans to build two new aircraft carriers, the National Audit Office in July 2011 said it had “deep concern” about the project and does not understand how the Ministry of Defence reached decisions to press ahead, or how the department can be sure it will provide value for money. In a 40-page study, the NAO reports discovering MoD papers which stated that cancelling the programme would save more than £1bn – contradicting remarks made last year by the defence secretary (now ex), Liam Fox, who said it would cost more to cancel than to build them. After reading the findings, the chair of the public accounts committee, Margaret Hodge, said it was clear the NAO had been denied access to certain Cabinet Office papers about the carrier programme. “This lack of transparency over such a crucial and costly decision is not acceptable,” said Hodge. The NAO report sets out how the carrier programme has fundamentally changed over the past five years and notes that the department “is delivering a lower scale of carrier capability, later than planned and at significantly higher cost” than had been originally envisaged. Last year’s Strategic Defence and Security Review set out how one of the two ordered carriers will be mothballed as soon as it is built, and the second – HMS Prince of Wales – will not come into service before 2020. However, the NAO notes that even when the carrier is ready, it may still only have a small number of the fighters – possibly as few as 12. Separate studies have shown the cost of the JSFs is rising, with latest estimates put at $100m (£62.5m) each. Under the proposals set out in last year’s SDSR, the UK will be without a carrier for almost a decade – the longest such period for the armed forces since 1918. The NAO report says that when the HMS Prince of Wales is in service it will “give approximately 150-200 days at sea each year”, meaning that for almost half the year the UK will be without any carrier, and will have to rely on help from the American and French fleets. March 2012 More trouble with aircraft carriers. May 2012 Government u-turn on planes for carriers costs 100million? 3. Chinook Mk3. Whilst British lives were being lost in Iraq and Afghanistan for want of helicopters, 8 Boeing Chinook MK 3’s were sitting in a hanger in Boscombe Down because of a massive procurement error. MOD forgot to ask for software codes for cockpit systems, after 30 months of negotiating with Boeing (So much for special relationship) the MOD decided to strip out the cockpits and start again! The Commons Public Accounts Committee described their purchase as ‘one of the worst examples of equipment procurement ever’. Now entering service 15 years after being ordered! 4. FSTA. At £750 million each the RAF’s 14 new air to air refuelling tankers are probably the most expensive planes ever bought. The Future Strategic Tanker Aircraft were bought as part of a Private Finance Agreement. Cost of the aircraft £2.69 billion. Cost of the 27 year servicing agreement £2.16 billion. PFI bill to MOD £12.01 billion. ( see NAO Nov 2011) How do they get away with it? Lack of cockpit armour has added another substantial cost ( they can’t be used over Afghanistan otherwise). 5 years behind schedule, in service 2014. 5. FRES. The Future Rapid Effects System was to comprise 3,700 lightweight vehicles costing £14 billion. Due to MOD prevarication over specifications progress took years. With £255 million spent on development, budget cuts in 2008 killed the project. It has been contractually easier to do this rather than cut elsewhere. Despite this, the MOD awarded a contract to General Dynamics for 7 FRES vehicles for £500 million. Very unlikely this vehicle will go into production. Well maybe, the MOD has allocated £1.3billion for armoured fighting vehicles. In Dec 2011 the Parliamentary Parliamentary Public Accounts Committee reported that the MOD had spent £1.1 billion without a single new fighting vehicle being supplied. In response to the vehicle crisis in Afghanistan , the MOD made emergancy orders for vehicles to meet the specific requirements in Afghanistan. As they aren’t what the army wants to meet long term needs, they will probably be left abroad. Can it get worse? 6. Landing ship dock. Briefly. In 2000 shipbuilders, Swan Hunter undercut their rivals to win a £150 million contract for two Royal Navy support vessels. BAE told the MOD they needed work or one of their shipyards would close, so in 2001 BAE were given a contract to build two more ships based on Swan Hunter design. It transpired Swan Hunter were incapable of completing the contract and the contract was transferred to BAE. The Swan Hunter shipyard shut. 7. Eurofighter Typhoon. First conceived as the fighter to attack Russian MiGs and tanks. 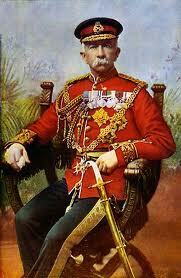 The first ‘European fighter’ jet was proposed and the UK, Germany.Italy and Spain formed a group to build it. Despite its maiden flight in 1994, delays caused the first RAF aircraft to be delivered in 2003 and began active duty in 2007. According to the National Audit Office the first cost estimate was £7 billion which rose in many jumps to £18.16 billion. (NAO Nov 2011) Guardian quote a figure of £20.2 billion. 8. Astute Nuclear subs. The MOD awarded a contract for 3 Astute Class nuclear powered subs in 1995 but BAE admitted in 2002 that the project was seriously over budget and behind schedule. This was blamed on difficulties in using computer aided design ( lack of skills) The MOD was forced to pump an additional £430 million into the project and BAE took a £250 million hit. 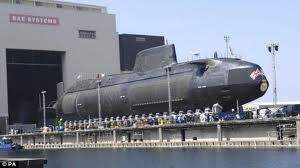 The MOD has bought a further 3 Astute subs with the government keen on one more! Initial estimate at approval £4.4 billion, current forecast for 6 subs £5.72 billion NAO Nov 2011. 9. Type 45 destroyers. 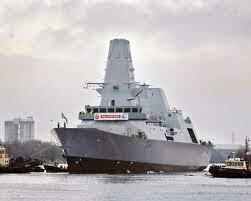 The Royal navy’s six new destroyers are possibly the most sophisticated warships ever built, claim F.T. The ships however are so expensive that the original order for 12 has been halved. The contract was given to BAE and Vosper Thornycroft (VT) before they had agreed to work together, which resulted in the MOD doing more of the contract than intended. The MOD were liable for costs if there were delays which of course there were. Expected cost £4.75 billion Actual £5.66 billion ( for half the original quantity!) Three year delay, ships being commissioned. 10. A400M. A military transport aircraft was conceived 30 years ago as a European project to replace the C-130 hercules. Jacques Chirac President of France insisted on a European engine designed from scratch instead of an American off the shelf engine. There have been multiple delays and the budget has increased from Euro 15 billion to 20 billion. The UK has refused to pump more money into the project and will take less planes instead. These are only the 10 best known examples, the Financial Times also found that The MOD will spend £1.2 billion on 3 surveillance aircraft that are older than the planes they are replacing, having scrapped the Nimrod project! Unbelievable. Deloitte LLP sum up why the MOD cannot cut costs. Fragmented organisation, ineffective strategic leadership, inadequate performance accountability, laborious management process, outdated people model, underpowered commercial capabilities. Phew! This adds to the argument for scrapping all of the military and having a token defence force. Very informative and a superb website. Britain’s militarism is sadly very potent and embraced in society. It’s clear that they put their own survival above the interests of the state. Shocking amounts of money spent on complete balls-ups. Glad you expose this to us. Keep up the good work!